I remember sitting down to eat this with a friend, casually, and with no big expectation. It was just another lovely-sounding combination I wanted to have a go at cooking. Partway through eating, we both slowed, then stopped. There was an easy silence. Both he and I wore a face of joy, coloured by the flush of mild wonder. It was one of those rare lunches that was delicious on every level: crushed, sweet roasted garlic, squeezed like purée from its papery skin; dark claret beetroot giving pure earth and sugar; and lovage, a tumbling wave breaking over everything. Heat the oven to 180°C/350°F/gas mark 4. Place the beetroots in a large pan and cover with water. Place the pan over a high heat, bring the water up to a simmer and cook the beetroots, uncovered, for 20–25 minutes, until they yield to the point of a knife. When the beetroots are ready, drain them and leave them to cool in the colander. When they’re cool enough to handle, slip off the skins and place the beetroots in a roasting tray. If they’re big, halve or quarter them so that all the pieces are roughly the same size. Add the whole garlic heads, the thyme (on the stalks), and the torn bay and lovage leaves. Season with salt and pepper and drizzle all over with the olive oil. Place the roasting tray in the oven and bake for 35–45 minutes, until the garlic is soft and tender and the beetroots are beginning to crisp and blister. 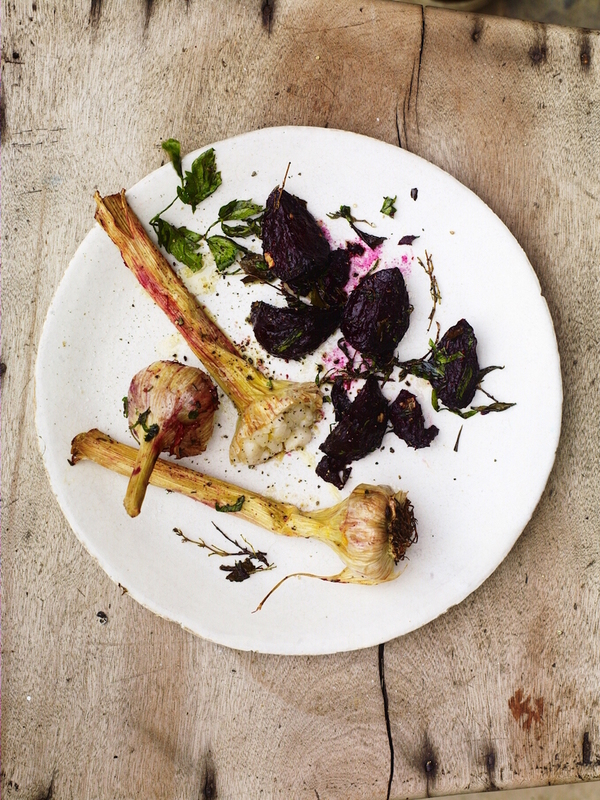 Place 2 or 3 of the roasted garlic bulbs on a plate, with a spoonful of beetroot and herbs alongside. This is excellent served with toasted sourdough.